007: What would you have done differently? As most of us here are quite dedicated fans of the franchise, and I'm sure could say that it is one of or even the best franchise out there. For me personally, it definitely is despite the problems some of the films have. A while ago, I created a discussion for 'SPECTRE: What would you have done differently?' I thought I'd create a new discussion where we can go through each James Bond film and say what we would have differently. First up, is the first ever James Bond, DR. NO. This is your chance to say whatever you would have differently wit the film, so things like; plot change, character additions or subtractions. Anything you like. People will be given the chance to give their responses within 7 DAYS from today (this may change so let me know if you want me to extend the time for longer) until the discussion moves on to the next James Bond film. This will run until we reach SKYFALL as a discussion for SPECTRE already exists. Hope you guys enjoy hearing everyone's responses! It's a near perfect film! What do you think it could have done to be exactly perfect? 1. Make sure Jack Lord got in a couple of days before filming started at the Kingston airport. He didn't arrive until the first day and they fell behind schedule by a half-day out of the box. 2. Be a little more honest with Film Finances, the company that provided the completion bond. If they had, Film Finances probably wouldn't have taken control of the movie during post-production. Ken Adam sent a memo to Harry Saltzman that the interior sets were going to cost more than budgeted. Saltzman didn't inform Film Finances. Eventually, Film Finances saw the Adam memo. The executives were not happy. Agreed, it's pretty much a near-perfect film. If anything, I would have given Dr. No a bit more screen time. It's a bit unfair because who could have known what FRWL and GF would bring, but I'd change the soundtrack. With the advantage of hindsight, I would have done a PTS complete with an official title track. I would have hewed closer to the novel in having Bond put through the "obstacle course" and Honey confronted with the black crabs. And the giant squid? Would that have been possible to film in '62? If so, do it. If not, perhaps he has to fend off a swarm of barracudas. And I'm a bit iffy on Dr. No's death. Not that it was poor, but to quote Elliot Carver, "it lacked...punch." Bond hurls him into the barracuda pool? And again, with the benefit of hindsight, a Barry score wouldn't have gone amiss. Yes, the soundtrack. That's what I'd change. Agreed. The score doesn't affect the film in a negative way, but thinking of what Barry brought with FRWL, one could only imagine what the film would be like with a Barry score. Other than that, I can't really think of much. It doesn't feel as big scale as the films to come, but as with the score, it isn't really a negative thing. Some of the better films are not the "biggest" in that sense. Now, if there's one little thing - and that's very little; I do feel that Anthony Dawson as Professor Dent look more menacing than Joseph Wiseman as Dr. No. Not that Professor Dent as a character is any more threatening than Dr. No, it's just that Dr.No in the film is somewhat controlled, and Professor Dent isn't, really. The score and a different Felix. Actually, I think Felix could be completely removed from the movie and nothing would change. Also I like the idea of having the obstacle course closer to the novel's, with the giant squid at the end. But really, as far as I'm concerned, it's pretty much a perfect film. I would have done a few more takes of Connery behind the wheel of the Sunbeam Alpine. It's a bit contrived even for 1962. Also, give it a Barry soundtrack & a PTS, as others have said. Other than that, it's great as it is. Lean and trim. There was a thread similar to this, where people discussed what they would change about the films. I think it cycled through DN to TB before the original poster disappeared. If they could've pulled it off with great tension and practical effects, I'd enjoy having the squid involved. Other than that, it doesn't get much better for me than DN. However, Wiseman is the spit and image of Fleming's Dr. No. Perfect casting choice, IMO. 1.) Get rid of the nuclear angle and that wretched bathing scene. Utter lunacy and it really bogs down the pacing as Bond and Honey enter No's lair. They should've just been taken from capture and been sent to their rooms to continue building the tension. 3.) John Barry on the score? Couldn't hurt. 4.) Expand Bond's fight with Dr. No, or give him more enemies to battle. In comparison to the finales like we'd get in later 60s films, this one feels in the prototype stages. It was the prototype though, so it's understandable. Still, it's amazing that even with a very meager budget the team were able to pull off a film that still holds up and embarrasses a lot of the later films with exponentially larger funds. The title sequence is quite bizarre and the changing of songs is jarring to say the least. That's all I'd fix. During the car chase I would tell Sean to take it a bit easy with the teethgrinding. That s it. Give the (formerly) crosseyed dragon a snaking neck that lashes out like whip, delivering flames to a target. It would look fantastic at nighttime and in silhouette. Then can be revealed as machine. And at least try the krakon. So we could see the deleted scene on Bluray. We got off to a slow start but it's been great to hear all your different ideas, love what I'm hearing. 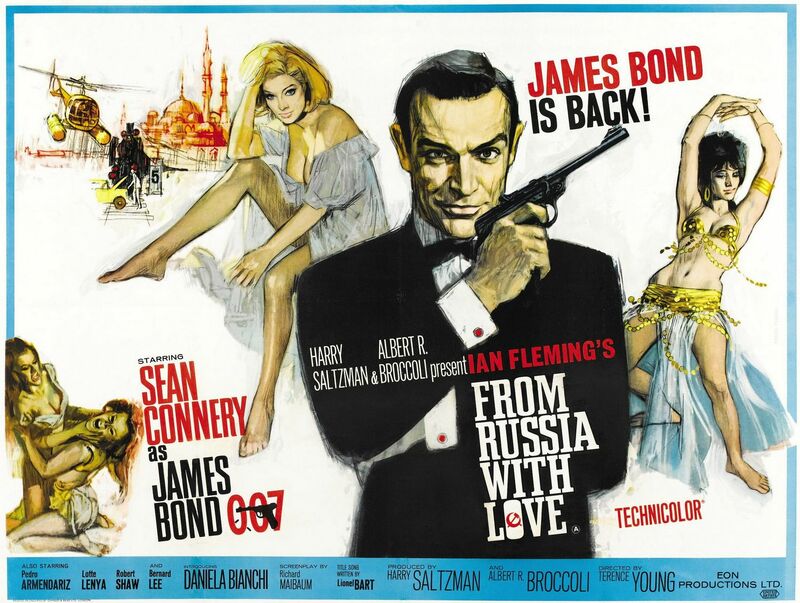 Now, it's been just over a week so I think it's time we moved on to FROM RUSSIA WITH LOVE. Again, this is your chance to say whatever you would have differently wit the film, so things like; plot change, character additions or subtractions. Anything you like. People will be given the chance to give their responses within 7 DAYS from today (this may change so let me know if you want me to extend the time for longer) until the discussion moves on to the next James Bond film. This will run until we reach SKYFALL as a discussion for SPECTRE already exists. Looking forward to hearing what you guys think. Hard to find significant fault with this one, but I'll try. Now I understand sensibilities were somewhat different in '63 than they are now, but it would have been marvelous to see Rosa Klebb in her "finery" in which she attempted to seduce Tatiana in the novel, and to see Tatiana flee Klebb's flat in horror rather than to submit to her advances. Such would have heightened Klebb's psychotic derangement and made her even more malevolent. More of Red Grant's backstory would have been nice, too. Fleming sets up the novel beautifully by describing Grant's serial murdering and his control by lunar cycles. Grisly by '63 standards, of course, but again, would have further elevated the villain's heinousness. Cut the boat turmoil at the end and you've got a perfect film. That is basically all that needs doing. A few other things bother (bombastic Bond theme while Bond checks for bugs in hotel room, Bond's wave on the boat at end), but they're not a big deal. Agreed with the points mentioned above - the boat chase and the wave. I'll ad to that the Monty Norman music from Dr. No, which is so out of place from the fantastic Barry score. Other than these things, it really is a fantastic movie with few flaws. So good, that it holds a #1 spot on my Bond film ranking. Is that Monty Norman music, or the John Barry additions to the DR. NO score? I ask because I don't think Norman was credited for anything more than the specific James Bond Theme. And likely over-credited. So to me it's a clue to how much Barry contributed in the first film. But yeah, it is garish in comparison. Changes to FROM RUSSIA WITH LOVE? There is the chance to use the cliffhanger ending with OO7's life in question. I guess the film needs the cheery ending, but something to think about.